Lana Trimble attended Denver School of Nursing, where she received her Bachelor in Science in Nursing. She also attended Tri-County Technical College, located in Pendleton, South Carolina, where she received her diploma in Surgical Technology. 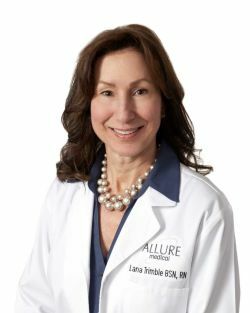 She is a Certified Surgical First Assist and certified in Wound Closure, from the Colorado Surgical Assisting, Inc. Lana is a member of the Association of Perioperative Registered Nurses, Surgical Assistants and Surgical Technologists. Lana's passion to help others began more than 25 years ago as a Surgical Technician. She advanced her career from a Surgical TEchnician to a Surgical First Assist and finally to a Registered Nurse in 2006. Over her years as a nurse, she's been able to maintain her proficiency as a Surgical Assistant and also acquire crucial foundational skills in urgent care and family practice settings. Lana joined the Allure family in 2018 and is excited to be a part of a company that is committed to quality care and successful patient outcomes. In her spare time, Lana enjoys cooking, scrapbooking and spending time with her two children and husband.